Not to be confused with Communal garden. According to Marin Master Gardeners, "a community garden is any piece of land gardened by a group of people, utilizing either individual or shared plots on private or public land". Community gardens provide fresh products and plants as well as contributing to a sense of community and connection to the environment and an opportunity for satisfying labor and neighborhood improvement. They are publicly functioning in terms of ownership, access, and management, as well as typically owned in trust by local governments or not for profit associations. Community gardens vary widely throughout the world. In North America, community gardens range from familiar "victory garden" areas where people grow small plots of vegetables, to large "greening" projects to preserve natural areas, to tiny street beautification planters on urban street corners. Some grow only flowers, others are nurtured communally and their bounty shared. There are even non-profits in many major cities that offer assistance to low-income families, children groups, and community organizations by helping them develop and grow their own gardens. In the UK and the rest of Europe, closely related "allotment gardens" can have dozens of plots, each measuring hundreds of square meters and rented by the same family for generations. In the developing world, commonly held land for small gardens is a familiar part of the landscape, even in urban areas, where they may function as market gardens. 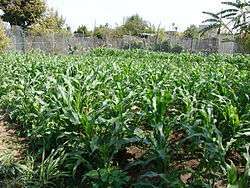 They also practice crop rotations with versatile plants such as peanuts, tomatoes and much more. Community gardens may help alleviate one effect of climate change, which is expected to cause a global decline in agricultural output, making fresh produce increasingly unaffordable. Community gardens are also an increasingly popular method of changing the built environment in order to promote health and wellness in the face of urbanization. The built environment has a wide range of positive and negative effects on the people who work, live, and play in a given area, including a person's chance of developing obesity  Community gardens encourage an urban community's food security, allowing citizens to grow their own food or for others to donate what they have grown. Advocates say locally grown food decreases a community's reliance on fossil fuels for transport of food from large agricultural areas and reduces a society's overall use of fossil fuels to drive in agricultural machinery. A 2012 op-ed by community garden advocate Les Kishler examines how community gardening can reinforce the so-called "positive" ideas and activities of the Occupy movement. Community gardens improve users’ health through increased fresh vegetable consumption and providing a venue for exercise. A fundamental part of good health is a diet rich in fresh fruits, vegetables, and other plant based foods. Community gardens provide access to such foods for the communities in which they are located. Community gardens are especially important in communities with large concentrations of low socioeconomic populations, as a lack fresh fruit and vegetable availability plagues these communities at disproportionate rates. The gardens also combat two forms of alienation that plague modern urban life, by bringing urban gardeners closer in touch with the source of their food, and by breaking down isolation by creating a social community. Community gardens provide other social benefits, such as the sharing of food production knowledge with the wider community and safer living spaces. Active communities experience less crime and vandalism. Land for a community garden can be publicly or privately held. One strong tradition in North American community gardening in urban areas is cleaning up abandoned vacant lots and turning them into productive gardens. Alternatively, community gardens can be seen as a health or recreational amenity and included in public parks, similar to ball fields or playgrounds. Historically, community gardens have also served to provide food during wartime or periods of economic depression. Access to land and security of land tenure remains a major challenge for community gardeners and their supporters throughout the world, since in most cases the gardeners themselves do not own or control the land directly. Some gardens are grown collectively, with everyone working together; others are split into clearly divided plots, each managed by a different gardener (or group or family). Many community gardens have both "common areas" with shared upkeep and individual/family plots. Though communal areas are successful in some cases, in others there is a tragedy of the commons, which results in uneven workload on participants, and sometimes demoralization, neglect, and abandonment of the communal model. Some relate this to the largely unsuccessful history of collective farming. Unlike public parks, whether community gardens are open to the general public is dependent upon the lease agreements with the management body of the park and the community garden membership. Open or closed-gate policies vary from garden to garden. However, in a key difference, community gardens are managed and maintained with the active participation of the gardeners themselves, rather than tended only by a professional staff. A second difference is food production: Unlike parks, where plantings are ornamental (or more recently ecological), community gardens often encourage food production by providing gardeners a place to grow vegetables and other crops. To facilitate this, a community garden may be divided into individual plots or tended in a communal fashion, depending on the size and quality of a garden and the members involved. In America, plots vary; for example, plots of 3m × 6m (10 ft × 20 ft = 200 square feet) and 3m x 4.5m (10 ft x 15 ft) are listed in Alaska. Montgomery Parks in Maryland lists plots of 200, 300, 400 and 625 square feet. In Canada, plots of 20x20 and 10x10 feet, as well as smaller "raised beds", are listed in Vancouver. The location of a community garden is a critical factor in how often the community garden is used and who visits it. Exposure to a community garden is much more likely for an individual if they are able to walk or drive to the location, as opposed to public transportation. The length of travel time is also a factor. Those who live within a 15-minute or less travel distance are more likely to visit a community garden as compared to those with a longer travel time. Such statistics should be taken into consideration when choosing a location for a community garden for a target population. While food production is central to many community and allotment gardens, not all have vegetables as a main focus. Restoration of natural areas and native plant gardens are also popular, as are "art" gardens. Many gardens have several different planting elements, and combine plots with such projects as small orchards, herbs and butterfly gardens. Individual plots can become "virtual" backyards, each highly diverse, creating a "quilt" of flowers, vegetables and folk art. Raised beds are sometimes used to separate plants from surrounding natural plants or to improve ease of access, especially for disabled gardeners. The community gardening movement in North American prides itself on being inclusive, diverse, pro-democracy, and supportive of community involvement. Gardeners may be of any cultural background, young or old, new gardeners or seasoned growers, rich or poor. A garden may have only a few people active, or hundreds. Finally, all community gardens have a structure. The organization depends in part on whether the garden is "top down" or "grassroots". There are many different organizational models in use for community gardens. Some elect boards in a democratic fashion, while others can be run by appointed officials. Some are managed by non-profit organizations, such as a community gardening association, a community association, a church, or other land-owner; others by a city's recreation or parks department, a school or University. Gardeners may form a grassroots group to initiate the garden, such as the Green Guerrillas of New York City, or a garden may be organized "top down" by a municipal agency. The Los Gatos, California-based non-profit Community Gardens as Appleseeds offers free assistance in starting up new community gardens around the world. In most cases, gardeners are expected to pay annual dues to help with garden upkeep, and the organization must manage these fees. The tasks in a community garden are many, including upkeep, mulching paths, recruiting members, and fund raising. Rules and an 'operations manual' are both invaluable tools, and ideas for both are available at the ACGA. Community gardens have been shown to have positive health effects on those who participate in the programs, particularly in the areas of decreasing body mass index and lower rates of obesity. Studies have found that community gardens in schools have been found to improve average body mass index in children. A 2013 study found that 17% of obese or overweight children improved their body mass index over seven weeks. Specifically, 13% of the obese children achieved a lower body mass index in the overweight range, while 23% of overweight children achieved a normal body mass index. Many studies have been performed largely in low-income, Hispanic/Latino communities in the United States. In these programs, gardening lessons were accompanied by nutrition and cooking classes and optional parent engagement. Successful programs highlighted the necessity of culturally tailored programming. There is some evidence to suggest that community gardens have a similar effect in adults. A study found that community gardeners in Utah had a lower body mass index than their non-gardening siblings and unrelated neighbors. Administrative records were used to compare body mass indexes of community gardeners to that of unrelated neighbors, siblings, and spouses. Gardeners were less likely to be overweight or obese than their neighbors, and gardeners had lower body mass indexes than their siblings. However, there was no difference in body mass index between gardeners and their spouses which may suggest that community gardening creates healthy habits for the entire household. Participation in a community garden has been shown to increase both availability and consumption of fruits and vegetables in households. A study showed an average increase in availability of 2.55 fruits and 4.3 vegetables with participation in a community garden. It also showed that children in participating households consumed an average of two additional servings per week of fruits and 4.9 additional servings per week of vegetables. There is strong support among American adults for local and state policies and policy changes that support community gardens. A study found that 47.2% of American adults supported such policies. However, community gardens compete with the interests of developers. Community gardens are largely impacted and governed by policies at the city level. In particular, zoning laws strongly impact the possibility of community gardens. The momentum for rezoning often comes from the public need for access to fruits and vegetables. Rezoning is necessary in many cities for a parcel of land to be designated a community garden, but rezoning doesn’t guarantee garden will not be developed in the future. Further policies can be enacted to protect community gardens from future development. For example, New York State reached a settlement in 2002 which protected hundreds of community gardens which had been established by the Parks and Recreation Department GreenThumb Program from future development. At times, zoning policy lags behind the development of community gardens. In these cases, community gardens may exist illegally. Such was the case in Detroit when hundreds of community gardens were created in abandoned spaces around the city. The city of Detroit created agricultural zones in 2013 in the middle of urban areas to legitimize the over 355 “illegal” community gardens. The first Australian community garden was established in 1977 in Nunawading, Victoria followed soon after by Ringwood Community Garden in March 1980. The squatted social center Can Masdeu is home to one of the largest community gardens in Barcelona. Most older Spaniards grew up in the countryside and moved to the city to find work. Strong family ties often keep them from retiring to the countryside, and so urban community gardens are in great demand. Potlucks and paellas are common, as well as regular meetings to manage the affairs of the garden. In the United Kingdom, community gardening is generally distinct from allotment gardening, though the distinction is sometimes blurred. Allotments are generally plots of land rented to individuals for their cultivation by local authorities or other public bodies—the upkeep of the land is usually the responsibility of the individual plot owners. Allotments tend (but not invariably) to be situated around the outskirts of built-up areas. Use of allotment areas as open space or play areas is generally discouraged. However, there are an increasing number of community-managed allotments, which may include allotment plots and a community garden area, many of them overseen by the Federation of City Farms and Community Gardens (a registered charity). The community garden movement is of more recent provenance than allotment gardening, with many such gardens built on patches of derelict land, waste ground or land owned by the local authority or a private landlord that is not being used for any purpose. A community garden in the United Kingdom tends to be situated in a built-up area and is typically run by people from the local community as an independent, non-profit organisation (though this may be wholly or partly funded by public money). For example, Norwich's Fifth Quarter Community Garden. It is also likely to perform a dual function as an open space or play area (in which role it may also be known as a 'city park') and—while it may offer plots to individual cultivators—the organisation that administers the garden will normally have a great deal of the responsibility for its planting, landscaping and upkeep. An example inner-city garden of this sort is Islington's Culpeper Community Garden, which is a registered charity, or Camden's Phoenix Garden. There is an extensive network of community gardens and collective urban farms in Taipei City often occupying areas of the city that are waiting for development. Flood-prone river banks and other areas unsuitable for urban construction often become legal or illegal community gardens. The network of the community gardens of Taipei are referred to as Taipei organic acupuncture of the industrial city. Often externally supported, community gardens become increasingly important in developing countries, such as West African Mali to bridge the gap between supply and requirements for micro-nutrients and at the same time strengthen an inclusive development. ↑ This apparently means 125m2 or about 1345 square feet, equivalent to a plot of about 15ft x 90ft. Wikimedia Commons has media related to Community gardens. ↑ What is a community garden? ; American Community Garden Association; 2007; accessed on 2007-11-01. ↑ Hannah, A.K. ; & Oh, P. (2000). Rethinking Urban Poverty: A look at Community Gardens. Bulletin of Science, Technology and & Society. 20(3). 207–216. ↑ Ferris, J.; Norman, C.; & Sempik, J. (2001). People, Land and Sustainability: Community Gardens and the Social Dimension of Sustainable Development. Social Policy and Administration. 35(5). 559–568. ↑ "Tomatoes Secrets". Retrieved 6 July 2015. 1 2 3 Harris, E (2009). "The role of community gardens in creating healthy communities", Australian Planner, v. 46, no. 2 (June 2009) pp. 24–27. ↑ Xu, Y., & Wang, F. (2015). Built environment and obesity by urbanicity in the U.S. Health & Place, 34, 19-29..
↑ Nelson, Toni (1 November 1996). "Closing the nutrient loop: Using urban agriculture to increase food supply and reduce waste". World Watch. 9: 10–17. ↑ : Kishler, Les. Opinion: community gardens are a serious answer to food supplies, health (2010, March 18) San Jose Mercury News. ↑ : Kishler, Les. Occupy Community Gardens (2012, February 12) Nation of Change. ↑ "Lean and green". Wellbeing.com.au. 1 May 2013. Retrieved 7 May 2013. ↑ Hartley, L., Igbinedion, E., Thorogood, M., Clarke, A., Stranges, S., Hooper, L., & Rees, K. (2012). Increased consumption of fruit and vegetables for the primary prevention of cardiovascular diseases. Protocols Cochrane Database of Systematic Reviews. ↑ Chen, D., Jaenicke, E. C., & Volpe, R. J. (2016). Food Environments and Obesity: Household Diet Expenditure Versus Food Deserts. Am J Public Health American Journal of Public Health. ↑ Harris, E (2009). Non-profit organizations in Kansas City and elsewhere help children, community groups, and low-income people grow gardens. "The role of community gardens in creating healthy communities", Australian Planner, v. 46, no. 2 (June 2009) pp. 24–27. ↑ Melville Court, Chatham, Kent," Moiser, Steve, Landscape Design, no306 (Dec. 2001/Jan. 2002) p. 34. ↑ Hogbin, Tricia (20 November 2015). "How to start a community garden". NineMSN. Archived from the original on 20 November 2015. ↑ Evelly, Jeanmarie (24 September 2014). "How You Can Turn New York City's Vacant Lots into Community Gardens". DNAinfo New York. Archived from the original on 21 September 2015. ↑ "At The Community Garden, It's Community That's The Hard Part". NPR. 2012-03-20. Retrieved 2012-04-26. ↑ Selected factors influencing the success of a community garden, by Gordon Arthur Clark. Kansas State University, 1980. ↑ "Allotments: a plotholder's guide" (PDF). Retrieved 18 May 2015. ↑ "Allotments and community gardens". Lewisham Borough Council. Retrieved 18 May 2015. ↑ "Parks and Recreation: Community Gardens". Municipality of Anchorage. Retrieved 18 May 2015. ↑ "Community Gardens Program". Montgomery Parks, Maryland. Retrieved 18 May 2015. ↑ "Community Gardens". City of Vancouver. Retrieved 18 May 2015. 1 2 Blaine, Thomas W.; Grewal, Parwinder S.; Dawes, Ashley; Snider, Darrin (December 2010). "Profiling Community Gardeners". 48 (6). Archived from the original on 5 May 2016. ↑ Urban preservation: How greening small spaces can strengthen community roots in Ottawa, Canada. 1 2 Castro DC, Samuels M, Harman AE. Growing healthy kids: a community garden-based obesity prevention program. American Journal of Preventive Medicine. 2013 Mar;44(3 Suppl 3):S193-9.Chen, D., Jaenicke, E. C., & Volpe, R. J. (2016). Food Environments and Obesity: Household Diet Expenditure Versus Food Deserts. Am J Public Health American Journal of Public Health. ↑ Davis JN, Ventura EE, Cook LT, Gyllenhammer LE, Gatto NM. LA Sprouts: a gardening, nutrition, and cooking intervention for Latino youth improves diet and reduces obesity. Journal of the American Dietetic Association. 2011 Aug;111(8):1224-30. doi: 10.1016/j.jada.2011.05.009. ↑ Zick CD, Smith KR, Kowaleski-Jones L, Uno C, Merrill BJ. Harvesting more than vegetables: the potential weight control benefits of community gardening. American Journal of Public Health. 2013 Jun;103(6):1110-5. ↑ Robert Fox Elder. (2005). protecting new york city's community gardens. New York University Environmental Law Journal, 13, 769-803. ↑ "Ringwood Community Garden". Retrieved 29 January 2014. ↑ Environment and Sustainable Development Directorate (5 April 2013). "A Study of the Demand for Community Gardens and their Benefits for the ACT Community". ACT Government. Retrieved 14 April 2013. ↑ "Urban Gardens". Urbangardensbarcelona.wordpress.com. 2009-11-25. Retrieved 2011-12-11. ↑ "About FCFCG". Federation of City Farms and Community Gardens. Retrieved 12 January 2014. ↑ "Culpeper Community Garden: Islington's Green Oasis". Retrieved 12 January 2014. ↑ "The Phoenix Garden". Retrieved 12 January 2014.